John McDonnell has expressed regret for his claim that centre-left Labour MPs were carrying out a “soft coup” against Jeremy Corbyn. The shadow chancellor showed “contrition” when he addressed the weekly meeting of the party in the run-up to tomorrow’s Budget and said that a united Labour Party is what “the Tories fear most”. McDonnell was questioned by MPs, including Wes Streeting and Peter Kyle, about his claims following the Copeland by-election defeat that a “soft coup” was underway and was being led by the “Murdoch media empire” and an “exceptionally well-resourced dark arts operation”. His intervention followed the controversial Brexit speech by Tony Blair days before the west Cumbria vote and Lord Mandelson’s claim that he is working “every single day” to bring day Jeremy Corbyn. Last night McDonnell, Corbyn’s closest ally, struck a more conciliatory tone, when he urged the parliamentary Labour Party (PLP) to come together and said the leader had the potential to become the “most transformative Labour prime minister since Clement Attlee”. He set out the core of the Labour frontbench attack on Philip Hammond, the chancellor, who is expected to announce more funding for schools when he delivers his first Budget tomorrow. 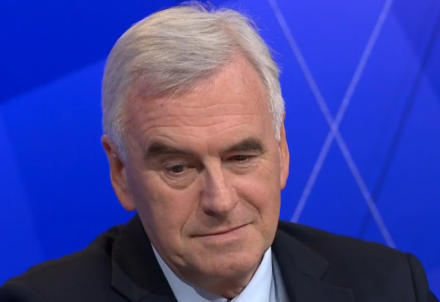 McDonnell said Labour would focus on low pay and the number of people who do not receive the minimum wage; the affect of a “rigged economy” which benefits the privileged few; the crisis in NHS and social care; and the need for an economy that “works for women”, particularly following the disproportionate impact they faced of spending cuts and benefit changes. “What the Tories fear most is a united Labour Party,” McDonnell told the meeting, as he highlighted the work of former shadow ministers Rachel Reeves, Caroline Flint and Angela Eagle in exposing the reality of Tory economic policies. In recent weeks the veteran left-winger has pledged to meet centre-left critics within the PLP and last night it was confirmed he would make contact with Mandelson, one of the key architects of New Labour, to “share a cup of tea”. “I won’t give out any details but yes we have begun our ‘tea offensive'” a spokesperson for McDonnell said.